It’s February–How Are You Doing on Your Goals? Have you peeked at the calendar lately? It’s already February! After the rapid passing of the first few weeks of 2013 it’s time to ask a question: How are you doing on your goals? Remember all those grand plans you had for the 2013? All those New Year’s resolutions? How are you progressing? 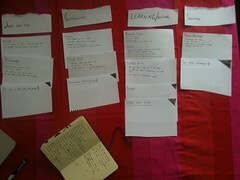 Earlier this year I came up with some ambitious and exciting plans for myself. I broke it into categories like: personal spiritual growth, family, and ministries. I have goals like: read the entire Bible twice in one year; have a “digital free” evening (no t.v., iPhones, computers, etc.) with the family at least once a week; and average at least 1,000 words a week on my personal blog. But setting goals isn’t enough. Unless you make a plan to frequently check your progress against the goals you set you’ll soon forget about them. It’s a truism that “we measure what matters.” So are you measuring your goals and monitoring your progress? If you had a goal to lose 20 pounds this year, how much have you lost in the first month of the year? If you wanted to launch your own blog have you taken the first steps? If you determined to make a budget and stick to it do you know how much over- or under-budget you are at this very moment? We measure what matters. So the best way to achieve your goals, if they are worthy goals that you care about, is to start keeping track of your progress. Trying to measure your goals is also a good way to assess them. If you can’t quantify your goals in some form–words per week, minutes per day, business contacts made in a single month–then you may need to revise your goals to be more specific and concrete. Along the way I’ve discovered that I’m visual and kinesthetic. I like to see a panoramic view of all my stats. And I like to input the data by hand as opposed to typing it on a computer. There’s something about writing down the numbers that gives me a sense of satisfaction. It’s like the feeling you get from checking off or crossing out an item on your “To Do” list. So I made some templates with empty tables for the numbers I wanted to measure and printed them out. 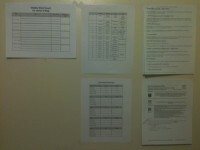 I taped these documents in a prominent place on the wall so I can see them frequently and easily. Having these measuring tools readily accessible also helps me to be consistent. Consistently checking your progress is a key to reaching your goals. I also formatted these templates in such a way that I can track the data from multiple days and weeks on the same page. I can see information from the past two weeks or an entire month at-a-glance. It helps me keep up the effort or work harder when I see how I achieved or missed my goals in the past. Seeing multiple data sets at one time can do more than just motivate you. It also helps you identify patterns of strength and weakness in your practice so you can adjust your goals. For instance, analyzing the numbers on my other website (RAAN), showed me that even though we release new articles on Mondays, Tuesdays sometimes have more visitors because we’ve had more time to spread the word about the post. Setting goals is good. But setting goals and frequently and consistently monitoring them is even better. If you’re already doing this, way to go! Keep it up. But if you haven’t made much progress on your goals, it’s not time to give up. Maybe your next step is to start measuring your progress. I suspect that by the start of March you’ll be pleased about what happened in February.